There has been much discussion over whether or not the labeling of "GMO" foods would add to the cost of food production or not. This was one of the supporting arguments for GMO labeling at the legislative hearing at the Maryland House of Delegates Committee on Health and Government Operations during which Doug Gurian-Sherman of the Union of Concerned Scientists and Michael Hansen of the Center for Food Safety, both insisted that labeling costs would be minor at best. Apparently not, nor does anyone else who thinks that "GMO" labeling won't increase the cost of food. Seed corn is ordered and delivered to farm, then planted in the spring around May. By summer, it looks like this. By fall, it looks like this. It gets harvested between September and November. Corn is transferred from the combine to a tractor trailer truck. The grain is hauled here to our on-farm grain bins for storage. that require segregation from commodity grains. 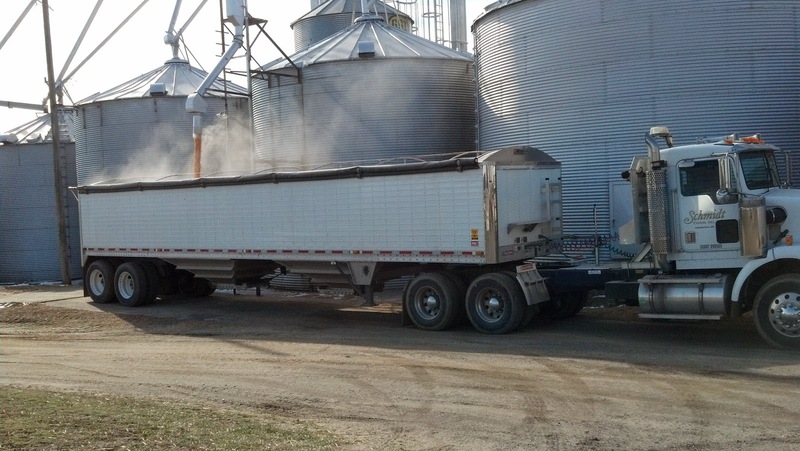 When its time to sell, we reload the trucks and haul it to the local grain elevators. And that's just 3 of the local grain elevators. We have several other options depending on who is buying our grain. 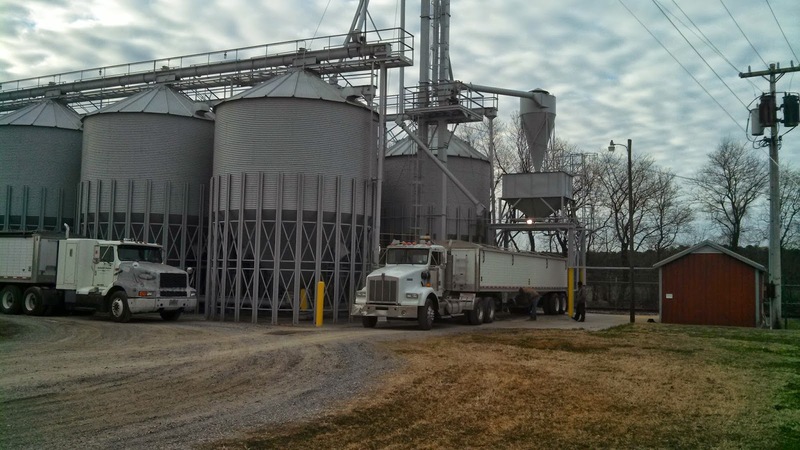 We and all our farming neighbors deliver to the same elevator and unload grain. This is called "commingling" where our crop is combined with everyone else who delivers to the same elevator and stored together in these large bins, regardless of what variety or trait of corn was grown. So where's the cost you ask? Well, every farmer in the region is hauling grain usually around the same time... to the same group of elevators. Hopefully you read my blog on seed choice last year and realize that all farmers determine their own purchases for seed and we don't all grow the same thing. In fact, we grow 3-4 different varieties of corn ourselves. Why? Because we match the varieties of corn to our soil types. That's called good stewardship and good business practice. 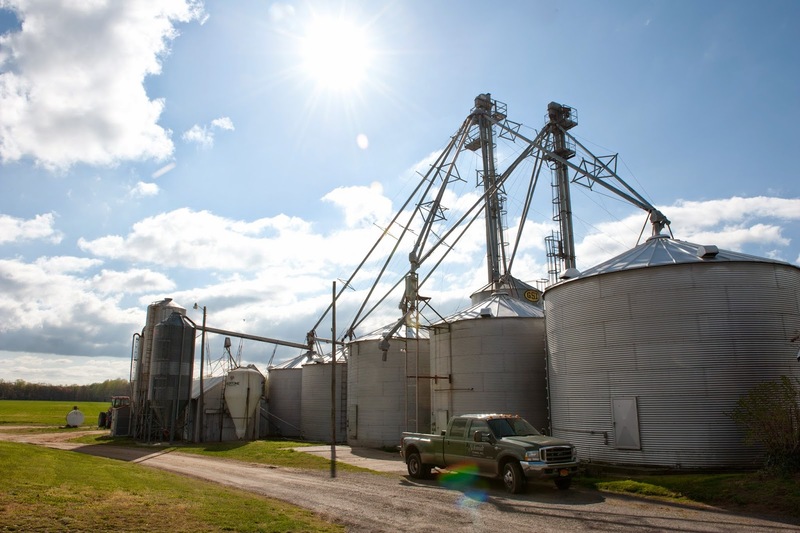 The food supply chain in the United States relies on a system of commingling, grain delivered to the elevator by farmers throughout the region. 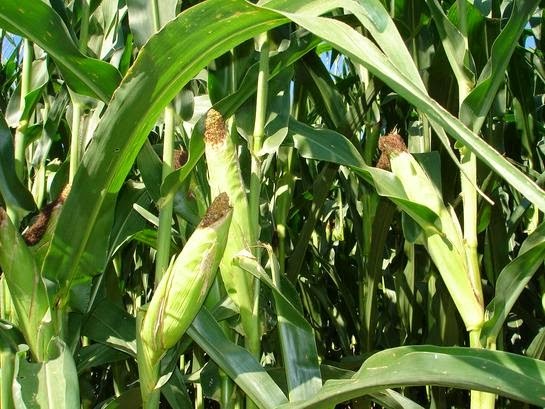 Maryland has 2 million acres of farmland, nearly a half million of which grew corn in 2012. 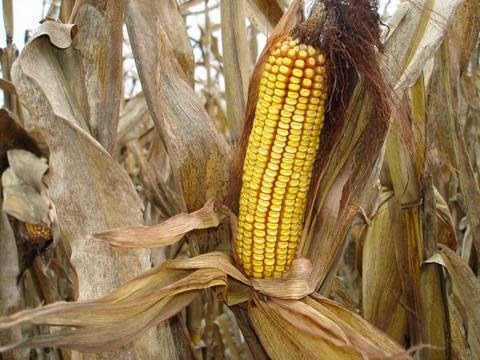 In a not very good growing year, Maryland farmers produce 53 million bushels of corn. If GMO labeling were to pass, that would require a HUGE addition to both on and off farm storage. Nationally, we're talking billions of dollars in infrastructure needed to segregate grain. What none of these labeling laws is clear about either is how to achieve this segregation? Should it be segregated by trait? by variety? both? The more layers of segregation, the more infrastructure is required and the more the costs escalate. Segregation is costly. We know because we do it every year, year in and year out, and have for years. We do it because we get paid a premium for ensuring that the specialty grains and seeds we grow are "identity preserved", very much like the certified organic process, involving higher management, higher tracking, and systems in place to ensure that the grains and seeds are genetically consistent and true to their traits, of highest quality meaning they are uniform in size, shape, color, free of weed seed and contamination. We will have 900 acres of grains and seeds this year that will require some protocol for identity preservation. They will be tested for the presence of GMO and tested to ensure that they are genetically consistent to parent seeds. This requires us to use some of our grain tanks for segregation. It requires us to do more "housekeeping", cleaning equipment, trucks, trailers, planters, harvesters, grain bins, etc... all along the food supply chain to ensure that we have preserved the identity of that crop. It is an inherently more costly system. So what are the costs? Here is my rudimentary analysis from the USDA Crop Production 2013 Summary. 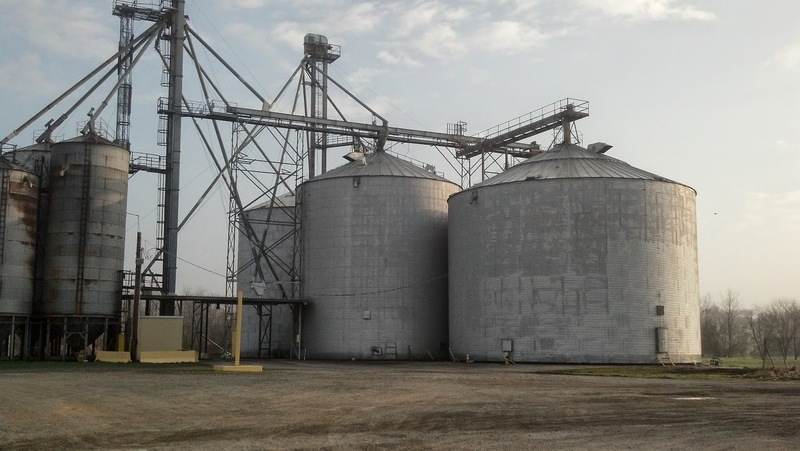 There is 13 billion bushels of on farm storage in the United States. 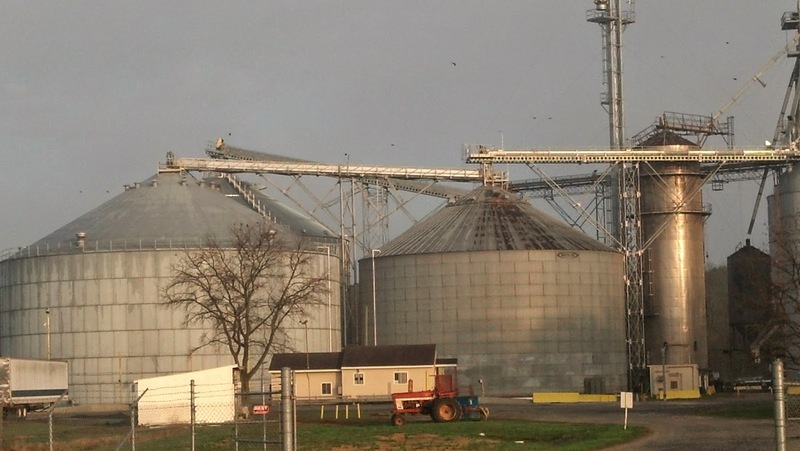 There is 10.4 Billion bushels of off farm storage in the United States. So 2013 produced roughly 23.5 billion bushels of 26 different grains and seeds, including those already in some form of identity preservation protocol, and have storage capacity of 23.6 billion bushels... without the extra infrastructure to segregate "GMO" from "nonGMO". To segregate, additional infrastructure would be required along the entire food supply chain from farm gate to grain elevator to processor to manufacturer, in order to separate corn, soybeans, and canola. A new grain bin cost approximately $2/bushel to buy and install, so a 50,000 bushel bin will cost $100,000. If we currently have sufficient storage for commingled grains and seeds, what will be the astronomical figure to segregate them by trait? That answer is dependent on how we are going to segregate. 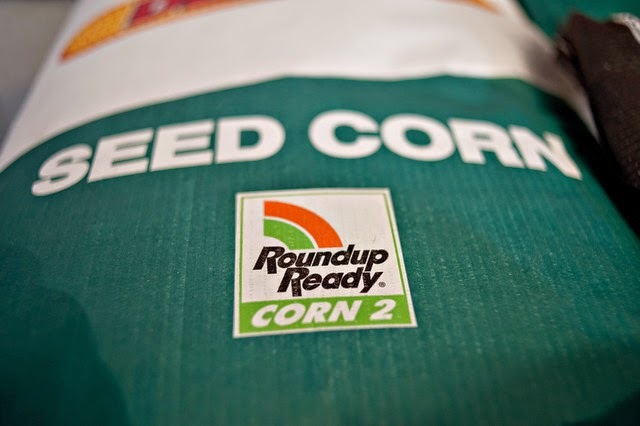 In order to have true traceability, GMO seeds and grains would have to be segregated by trait, so RoundUp ready traited grains would have to be segregated from Bt traited grains, and the stacked or combined traited grains would have to be segregated from those that are just Bt or just RoundUp Ready, and the combinations of traited grains would have to be segregated by the combination or stack of traits in the seeds too, because otherwise, you don't have "truth in labeling" to say which GMO is in the product. I mean surely, we need to label it by GMO trait right? because otherwise "we don't know". This is the premise by which the activists say is the problem right? The uncertainty of GMO? We can't commingle traited seeds and grains because then we no longer have true traceability. Absolute and utter segregation by trait or combination thereof is required to meet the demands of what is being called for in the GMO labeling legislation across the U.S. True GMO labeling will require vast capitalization of infrastructure to segregate grains and seeds by trait. (Read $$$$$$$$$$$$$$$$$$$$$$$$$$$$$$$$$$$$$$$$$$$$$$$$$$$$$$$$$$$$$$$$$$$$$$$$). And I've only been talking about the costs of grain storage. I can't even begin the fathom the costs that it would take to segregate all along the entire food supply chain, keeping GMO corn, soybean or canola ingredients segregated by trait from conventional counterparts from the farm to the processor to manufacturer. We're talking billions of dollars in order to maintain the absolute traceability of a certain genetic trait in a seed from farm to final product. Those who say GMO labeling won't add to the consumer's grocery bill need to go back to Economics 101 and some basic high school math. Its likely that as a nation, we'd never capitalize all that infrastructure to achieve true traceability. Which goes to the crux of the matter - this isn't about labeling, as I cited in my last GMO blog, labeling is a means to an end. As noted by many activist groups, the ulterior motive behind labeling is not about a consumer's right to know, it is about banning the technology.